Motherwell under-20s ace Barry Maguire is hopeful the team can make history by reaching the Irn Bru Cup quarter-finals this Saturday. 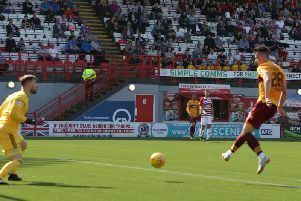 "There has been a buzz about the place," Maguire (20) told the Motherwell Times. "A lot of boys have been talking about it. Just for experience as well. "A lot of players haven't even played at Fir Park so it will be brilliant for a lot of the boys. "A couple of us have been in there before against Edinburgh City and Airdrie so we know what it's like. "We know how big a game it is and we know that the fans hopefully turn up again. "It should be a great game." Defender Maguire, who made his Motherwell first team debut in a 0-0 draw at St Johnstone last April, revealed that under-20s gaffer Stephen Craigan has been across to Ireland to scout on Sligo Rovers. "Crags has been over and he's had a look at them," Maguire added. "He knows what he's talking about so he will have us well prepared. "We will definitely play to our strengths. We will hopefully exploit their weaknesses. "Sligo have a lot more first team experience compared to a lot of our boys. "But it's nothing we can't handle. Most of us train against Curtis Main and Ryan Bowman, big boys. "So it should be a good experience."